Science supporters were out in droves throughout the Bay Area on Saturday, decrying President Donald Trump's policies and urging him and the rest of the U.S. to put faith in evidence-based science. Christie Smith reports. Science supporters were out in droves throughout the Bay Area on Saturday, decrying President Donald Trump's policies and urging him and the rest of the U.S. to put faith in evidence-based science. More than 500 communities around the world, including San Francisco, San Jose, Berkeley, Pacifica, Walnut Creek, Hayward and Livermore, participated in the "March for Science." In San Francisco, the rally began at Justin Herman Plaza and attracted hundreds of people. Social media posts indicated that trains heading into the city were jam-packed with people heading to "March for Science." It was standing-room only, one person wrote on Twitter. 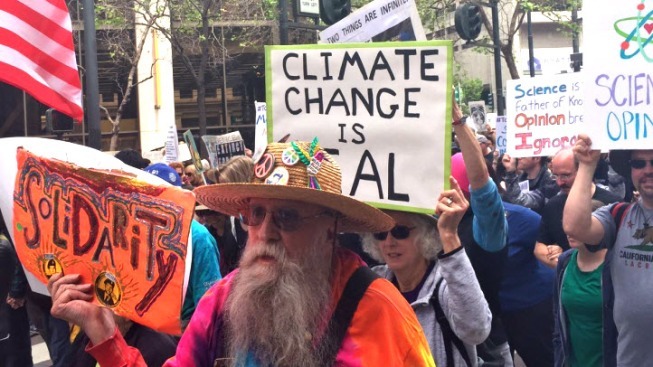 Meanwhile, crowds toting all manner of signs — some of which read "In science we trust" and "Climate change is real" — chanted, "What do we want? Fact-based evidence! When do we want it? After peer review!" Kishore Hari, an organizer for Saturday's event, expressed concern regarding President Trump's proposed budget cuts for scientific research. "Cutting the (Environmental Protection Agency), not funding any kind of climate research whatsoever, eliminating stem education in our schools, those are direct threats to our education," she said. Adam Savage, the former host of MythBusters, spoke to the teeming crowd in San Francisco and said that bias is the "enemy of science," according to Twitter. "When we see politicians move away from the best data toward their own biases, that is not policy that benefits everyone," Savage told the crowd. "That is policy that benefits the few." San Francisco Mayor Ed Lee tweeted his support for "March for Science." "Science is not alternate facts," he wrote. "#SF supports the scientists who improve our lives everyday." President Trump, in addition to taking to Twitter, offered his own Earth Day statement. "My administration is committed to advancing scientific research that leads to a better understanding of our environment and environmental risks," his statement read. In the East Bay, a march scheduled at UC Berkeley's Sproul Plaza kicked off at 4 p.m.
About 500 people had pre-registered to march across the mudflats and wetlands of the Hayward Regional Shoreline, a stretch of restored marshes beside the San Francisco Bay. In Livermore, winemakers and researchers and administrators from the Lawrence Berkeley National Laboratory and the Lawrence Livermore National Laboratory were scheduled to speak at a rally at Livermore High School. Afterward, marchers were invited to a family-friendly science fair with hands-on STEM activities for all ages. In Walnut Creek, a march took over the pavement at Civic Park. The event was coordinated by Women’s March Contra Costa, and billed as a nonpartisan rally to promote the importance of scientific research and advancement.